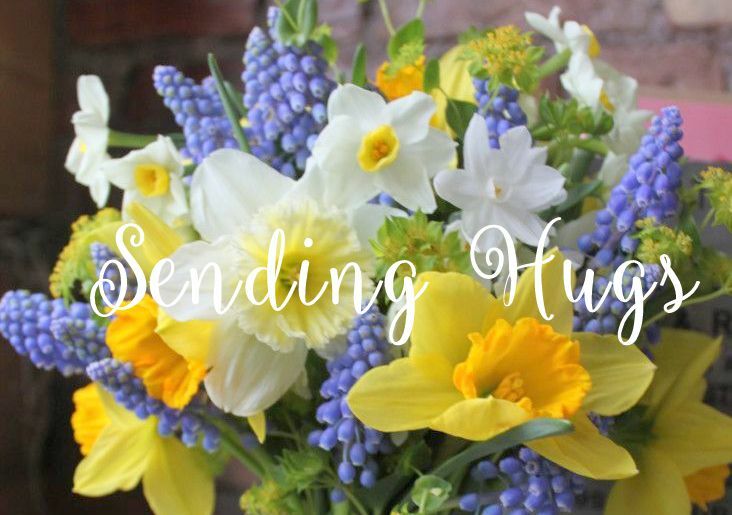 Welcome to the Lily Pad Cards Blog Hop! 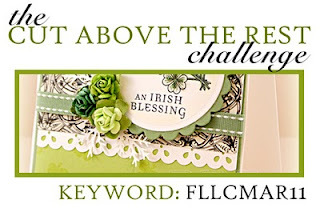 Welcome to stop #28, the final stop on day 4 of the Lily Pad Cards Blog Hop! 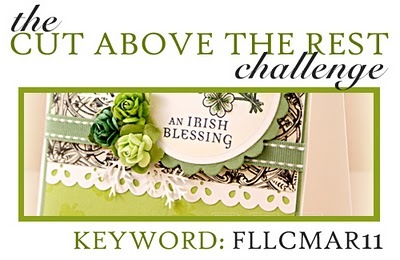 Lily Pad Cards is a new challenge blog that will feature interviews, articles, videos, challenges, great prizes, and more! You should have arrived here from sweet Ashley's blog. The Hop features 7 blogs each day. 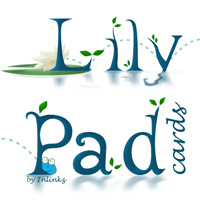 It started Monday, March 27 and will finish tomorrow, Friday, April 1, with the grand opening of Lily Pad Cards! 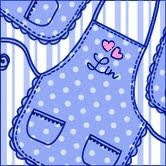 Although Lily Pad doesn’t officially open until tomorrow, you’ll be able to see a new sneak peek every day until then. And there are three prize packages with a total retail value of over $800 - including a $100 gift certificate to a very popular online store! Go here for specific prize details and contest rules. 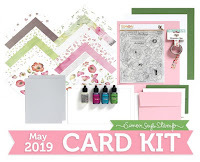 Our Hop’s theme is "Welcome" because we are welcoming Lily Pad Cards to the neighborhood, and we’re also welcoming all of you to come and join in all the fun! 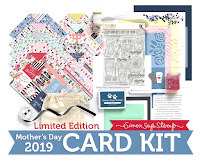 I am so honored to be a member of the Design Team of Lily Pad Cards, and to get to work with the other amazingly talented design team members! In thinking about the theme, my mind went to the wreaths that I hang on our front door and change with the seasons - it is my way of saying welcome to my friends when they come to visit. Thank you so much for visiting me today! 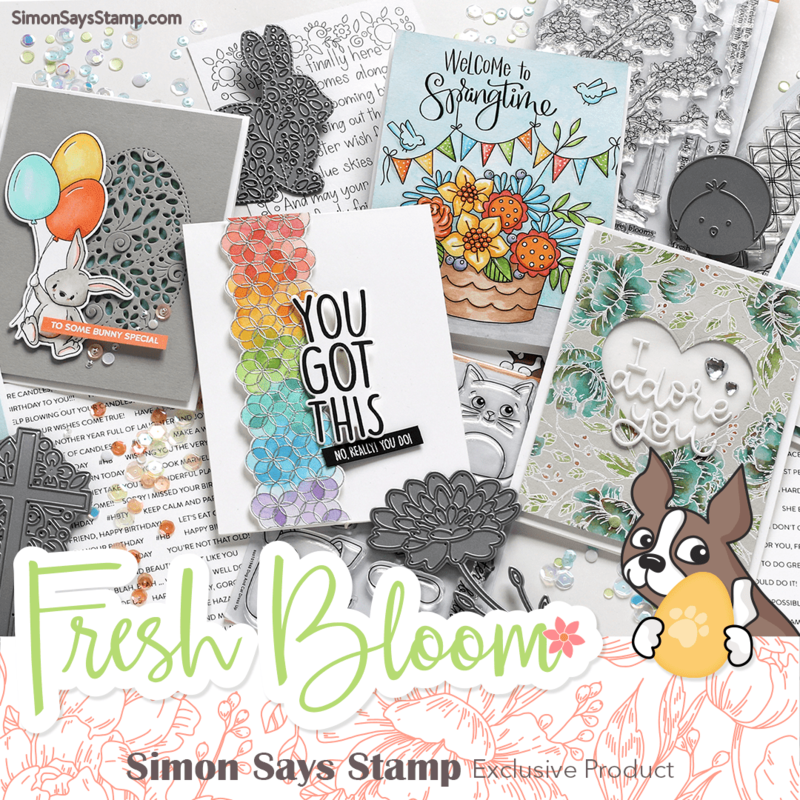 Tomorrow at 9:00 am EST, you can start the Hop again at the Penny Black Blog, and if you follow along you'll end up at the brand new Lily Pad Cards Blog as it officially opens! If you hit a bad link, you can always go to Lily Pad Cards and click on the next link in the hop. Please report any bad links to webmaster@inlinkz.com. Happy Hopping! For my window I used a Dienamics rolled rose die. And the cutout that resulted was made into the rose centering the stamped flower. I placed the window to take out most of the bird on the big background Musical Collage stamp and used my leaves to cover up what was remaining of the bird's tail and the branch. The leaves also hold up the stamped flower from the inside of the card. I placed a white square inside the card to contrast against the front of the card and the flower. I encourage you to look at the link above to see lots more examples of window cards. And here is the schedule for upcoming scrambles - the next one will be April 16, hosted by Sally. 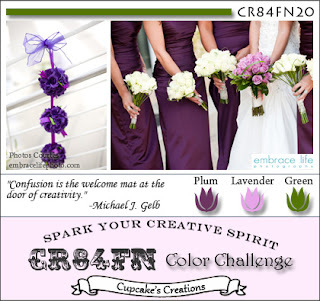 I chose to use the soft pastel colors from the inspiration. 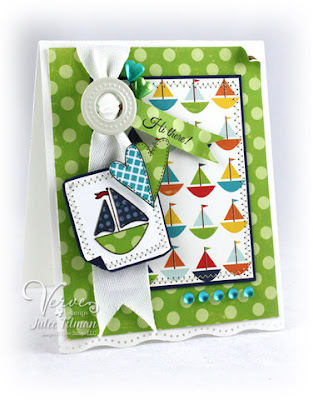 Welcome Lily Pad Cards Blog! 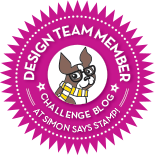 Just in case you've missed it, there's a new card challenge blog starting and it's launching with a week-long Blog Hop, starting today! Click here to start - I hear there are some nice prizes involved! 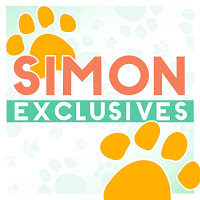 Please check back here on Thursday at 9 am to see my contribution! Still playing with some new little K&Company mat pads, from Susan Winget and Tim Coffey. The main flower panel and the little butterflies are from Susan Winget's Spring Blossom mat pad, and the striped background is from Tim Coffey's Cottage Garden mat pad. I just added a doily and some hand-dyed seam binding, and cut out the little butterflies as embellies. 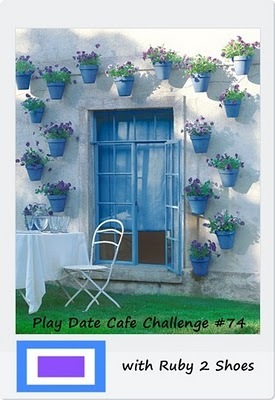 What an easy card and I know it will bring a smile to someone's face! Here's a card I made to enter into this month's challenge at the Hero Arts Blog. We have 3 options: to make a birthday card, decorate an envelope, or use a background stamping technique. I tried to do them all with my entry. Starting with a piece of white cardstock, I white embossed the "Happy Birthday" greeting. Then I inked an acrylic block with mustard seed, wild honey and spiced marmalade distress inks, spritzed with water, and stamped that over my greeting. After that was dry I overstamped the Friend Definition in vintage photo distress ink and then the Magical Background in spiced marmalade. That panel was then trimmed and framed in brown cardstock. Next I stamped a card-size white piece of cardstock in the same inks using the Envelope Pattern and the Magical Background again, and glued that to a brown card base. Lastly I stamped the large flower using Memories Art Print brown, and sponged on some wild honey distress ink, then used orange and white colored pencils to give it more definition. 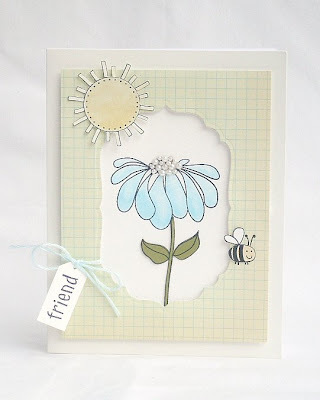 The smaller flower was stamped on white using spiced marmalade distress ink. I finished with a piece of white lace from Carole, and a large white pearl from Virginia. Once, again PDCC has surprised me with some colors I wouldn't probably have tried on my own. The inspriration picture made me think of a cottage in the French countryside, so I added the little bit of crochet lace to represent lacey curtains in my imaginary cottage. 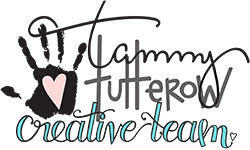 Here is my CASE of Julee Tilman's gorgeous card for CASE Study this week. 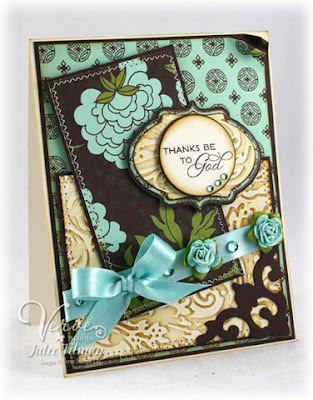 These gorgeous papers are all from a K&Company Tim Coffey designer mat pad. I adore these blues, and chose 3 of the papers for my card. Here is the gorgeous card by Julee Tilman that we are to CASE this week at CASE Study. I love everything about it, the sketch, the colors, all the elements. 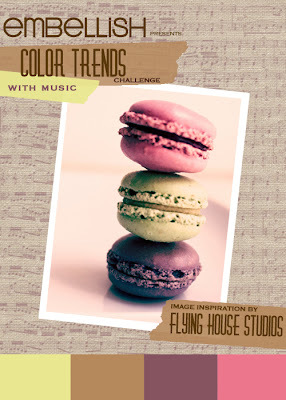 In short, you stamp an image on white cardstock. I colored mine using watercolor pencils. 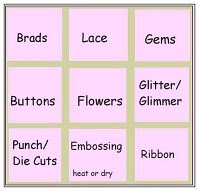 Next you run a piece of wax paper through an embossing folder, then place it over the stamped cardstock, cover that with a piece of scrappaper above and below (to protect your iron from wax) and then iron over it using your hottest setting and no water in the iron. Discard the wax paper, then, rub an ink directly onto the cardstock. I used tumbled glass, first using a sponge tool, but at the end rubbing the ink pad directly on the cardstock. Quickly use a paper towel to remove any extra ink, and the pattern begins to pop out - one of those magic moments! I went back in and used some markers to bring my flower and leaves back out, as they were a bit muddied from the blue ink. The finished panel was cut with a nesties label die, framed in pale pink, and then centered over aqua paper embossed with the same folder, adding my sentiment and a pale pink ribbon. This was fun, and I'll try it again! Thanks, Yvonne! After the houses were stamped and pieced and lined up, I thought they looked like faces smiling at me, so this sentiment seemed just right. This month we had 58 participants!! If you'd like to join in the fun, just check Deborah's Blog about the 25th of the month onward, and she'll have a sign-up post. 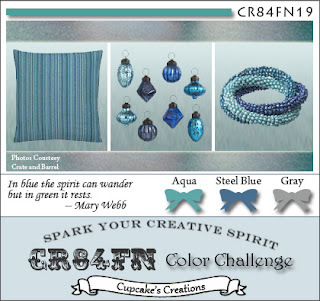 The Ribbon Girl Blog has a gorgeous selection of ribbons up for grabs if you win their color challenge this time! 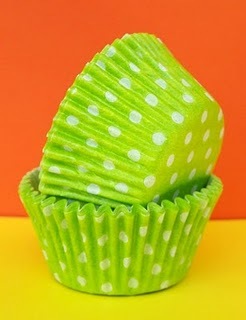 All you have to do is make something green and yellow! I am definitely in a Spring mood, and when I think of yellow, I think of daffodils, so I colored these digital daffodils by Jane with watercolor pencils, framed them in a scalloped green, and popped them above this luscious October Afternoon "Thrift Shop" designer paper. I still have some hand-dyed yellow ribbon from Donna, and then all I needed was a green button and the sentiment. Wish me luck - I REALLY want those ribbons! 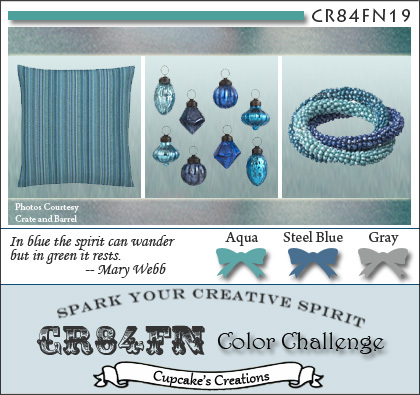 Such lovely springy colors this week at CR84FN! I started with this lovely photograph that Godelieve shared with us a few weeks ago - the colors are exactly right for the challenge, don't you think? Then I stamped the Classic Fabric Design twice, once in dusty concord distress ink on lavendar cardstock, and again with Grass chalk ink on green cardstock. I trimmed the green and layed it over the purple, matching the stamped designs, then centered the photograph of the crocuses. My only additions were the green gingham check ribbon, a button and twine, and the tiny sentiment. Jacqueline has her very own style which I am always aspiring to reach. She has a wonderful ability to put stamps together and make them a true work of art and she is so talented using distress inks. 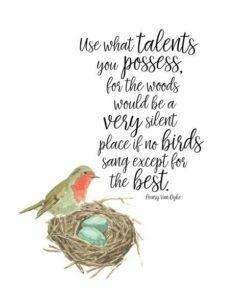 Her work is so outstanding that she doesn't need to use lots of embellishments like many of us do; her compostions can always stand by themselves with little needing to be added, just an occasional butterfly or bird. In studying her card, I couldn't think of anyting I'd do to improve it, so I decided to CASE it, just changing up the stamps used and brightening the colors a bit. Like Jacqueline, I started with a white panel. I stamped the Music Background using antique linen distress ink, and then smeared some broken china distress ink on a large acrylic block, spritzed it with lots of water, and then stamped it over the music. After that had dried, I inked my Garden Bouquet with markers, spritzed it with water and then stamped - I LOVE the watercolor look this gives. After that had dried thoroughly, I overstamped my sentiment, from the same set that Jacqueline used. Lastly I framed the panel in pink, mounted it on a white card, and then just added some tiny butterflies and some sparkly gems. Thank you, Jacqueline, for your constant inspiration both in creativity but also in your faith, and also for sharing both of them with us. I'm so glad to know you! 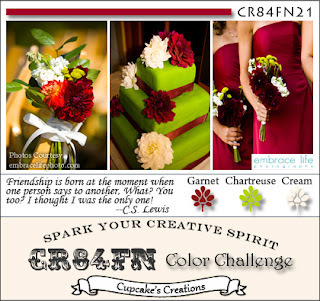 Please visit Jacqueline's blog and also her flickr photostream whenever you need some inspiration! And here's my card. I used mostly designer papers, given my almost 2 hours time constraint, except for the stamped flower and the sentiment. I LOVE these aquas and yellows together! I found this die-cut that had all of these colors and used it as my start, then stamped all of the background panels and added some bits of lace. My card uses some of my favorite diecuts and border punches, along with some die-cut Sizzix rolled roses that Suze sent me awhile back and another example of Susan Winget's beautiful art, the rose designer paper. I let the beautiful papers speak, the sentiment being the only thing stamped here. 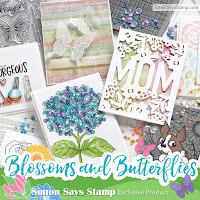 I am loving all the botanical papers that have been coming out this year, and was lucky enough to grab some of Susan Winget's and also some Grand Adhesions from her Spring Blossom collection, see detail below. I hope this trend continues for awhile, as these images just make me happy. I simply diecut the bird and nest paper, framed it with a dark brown, and placed that over the dotted blue paper. I added some tiny white flowers centered with blue pearls and some of Donna's beautiful hand-dyed blue seam binding. There really wasn't a good place for a sentiment. 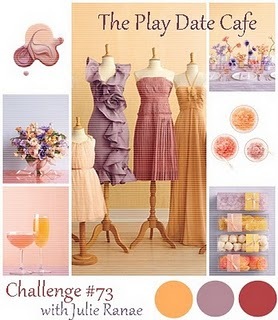 Here's a second entry, a little more shabby, for this week's Shabby Tea Room Birthday Bash celebration: "Party Time". Do you think these 2 had a little too much party? A sweet friend recently sent me several of these older Stampa Rosa House Mouse stamps dated 1997, and this is the first inking of this one for me. I colored it with colored pencils, making the cupcake like our oldest son David used to request his birthday cakes, with strawberry or cherry icing. To shabby it up a bit I added a doily cut in halves, some crinkled hand-dyed seam binding and a ribbon and button. Since the coloring was pretty pastel, I used pale pink, blue and green to frame it out. I used lots of new stamps, and did some paper-piecing using Cosmo Cricket dps. I wanted to use some sort of banner and decided to bring in this cute tree and birds to hang it on. Also entering this into Hero Arts monthly challenge, which includes Birthday cards. I'm still loving making these stamped layered backrounds, so here is another incorporating the colors for the challenge. I started with white paper, mooshed some weathered wood distress ink onto an acrylic block, spritzed with water and stamped over my white-embossed top-half of the Music Collage. Then I overstamped the Magical Backiground using faded jeans distress ink, and the real violet 3 times using broken china distress ink. This panel was then framed in aqua cardstock, layered over a panel each of grey and darker blue, stamped with the same Magical Background, and inserted a doily in between to bring out the white embossing. The ribbon is from Donna, the pearls from Virginia - thanks ladies! I REALLY love these colors together! And I got to paper-piece these fun flowers, so I'm also entering this into the Moxie Fab World Paper Piecing Challenge. 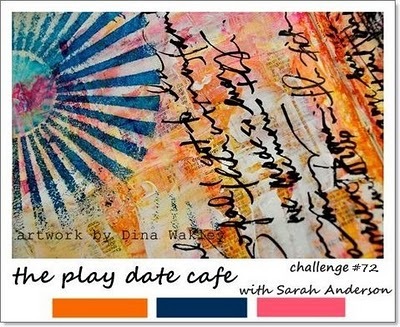 Here is the inspiration for the challenge this week at the Play Date Cafe. 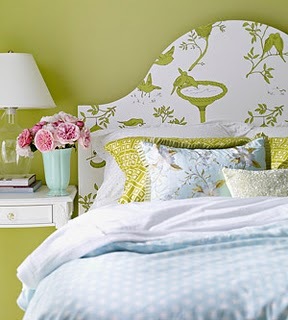 Really interesting mix of colors, don't you think? Here is my submission. I really loved the script and again, these colors were surprisingly fun to work with.